Expert review document part 2: methodology, terminology and clinical applications of optical coherence tomography for the assessment of interventional procedures. 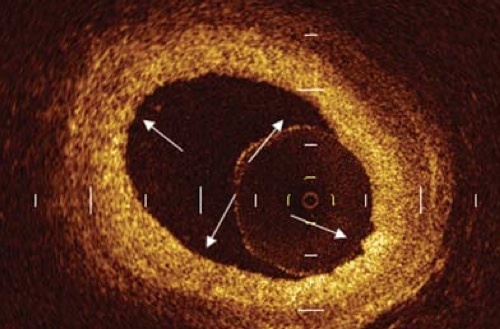 Frequency domain optical coherence tomography to assess non-ostial left main coronary artery. Consensus Standards for Acquisition, Measurement, and Reporting of Intravascular Optical Coherence Tomography Studies. Guillermo J. Tearney, MD, Writing Committee Co-Chair, Evelyn Regar, MD, Writing Committee Co-Chair, Takashi Akasaka, MD, Writing Committee Co-Chair, plus more than 50 other authors.